Box Office is open daily 11:30am-7pm, and Sunday's until 5pm. Doors open 90 minutes prior to shows. Real Music. Real Close. Music lovers of all ages can get up close to their favorite artists at this state-of-the-art live entertainment venue where every seat is like having a front row seat. 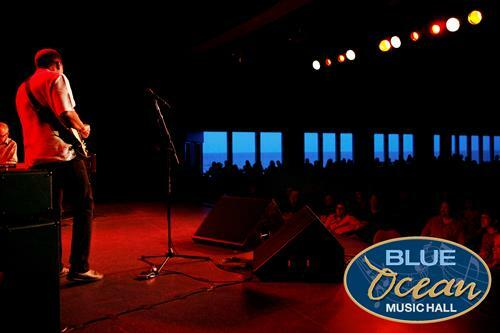 Offering national and regional artists, the award-winning year-round Blue Ocean Music Hall features both 468 seated capacity (cabaret-style) and 725-person general admission capacity (standing room only) shows, all within 50 feet of the stage. With more than 100 shows annually, concerts feature classic rock, blues, indie, jazz, acoustic, country and pop artists and have included such greats as Blue Oyster Cult, Kansas, Little River Band, Little Feat, The Outlaws, Dave Mason, Todd Rundgren, .38 Special, The Waterboys, Toots and the Maytals, Toad the Wet Sprocket, Ingrid Michaelson, Colby Caillat, Ani DiFranco, Martin Sexton, Donavon Frankenreiter, Kelly Pickler, David Gray and many more. Comedians such as Bob Marley, Lenny Clarke, Juston McKinney and others perform at the oceanfront venue regularly. PRE-SHOW DINING: Blue Ocean offers a pub-style menu and full beverage selections; doors open 90 minutes before show time. Two full-service restaurants are located on-site: Seaglass Restaurant and Lounge (www.seaglassoceanside.com) and Capri Seaside Italian Restaurant (www.capriseaside.com). Purchase tickets by calling 978.462.5888, go online to www.BlueOceanHall.com or visit the Box Office (open daily). New shows are announced regularly; please visit the website for updates and to sign up for our weekly show eblast. Blue Ocean is available for private functions and fundraisers.